I finally made something with this Sizzix XL die that I got from the store last year. The die is called Heart with Hearts. It is a heart shaped card and perfect to make Valentine cards. There are extra heart shaped pieces on the die that you can cut to use with the card. I used Hero Arts new "sweet wonderful you" clear stamp set for the girl and the words. 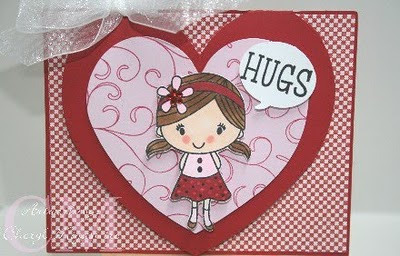 The pink heart is stamped from a Hero Arts cling stamp called flourish background. 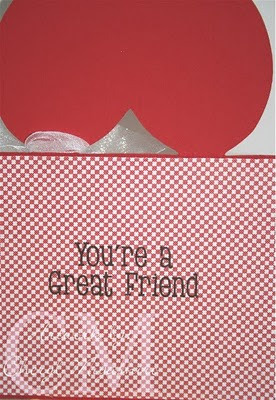 I stamped the inside of the card with you're a great friend from the sweet wonderful you set. I didn't realize that tiny checked patterned paper can make you dizzy when you look at it. LOL! Today is my daughter's birthday and I forgot to take a photo of the card that I made for her. Anyways, we're off to lunch and some girlie shopping time today. Tomorrow I'll be at Ben Franklin Crafts in Mapunapuna taping 2 live tv shows for the Joy of Crafting. If you're in the area stop by and say hello and don't forget that it is coupon day. Thanks for stopping by and hope you have a great day!!! Hugs to you too Cheryl! LOL Very cute card, love the sweet image & great layout. Hope you and your daughter had a fun day together - cute card too. Cute card. Love the heart shape and the cute image too! Hey Cheryl! Love this card and Happy New Year! Love how this card has the heart front and covers the sentiment inside. Hope you had a great holiday season! Didn't it fly by so fast! very cute card and image! i hope the store has those stamps...last time they were gone! cute card! love that heart shaped card. it is perfect for Valentine's day...the year is moving way too fast already! love your hero arts stamps. TFS and have a great end of the week! Hey Cheryl! Good to see you last week - I was so tempted to get the Big Shot Pro after I saw the bag you made, but I'm holding out. No room for it! This is such a cute card - I can't believe we're getting ready for Valentine's Day already! Thanks for always sharing you fantastic creations and enjoy the long weekend! Cute card Cheyrl. I love that stamp! I hope that you're doing well! Happy New Year! Cheryl love your car. Love the stamp too. TFS and have a great week.